VILSECK, Germany — Tucked away in the woods between Freihung and Vilseck is a family hiking gem called the Beaver Nature Trail, or Biberlehrpfad. back to the gravel road that leads back to the car parking area. To get to the trail, drive road ST2166 between Freihung and Vilseck and look for a pull through. A brown sign stating “Biberlehrpfad” and a blue parking sign denote the entrance. Photos by Christine Fox. For many of us American transplants who have yet to learn the local language, German informational signs are only good for the pictures. 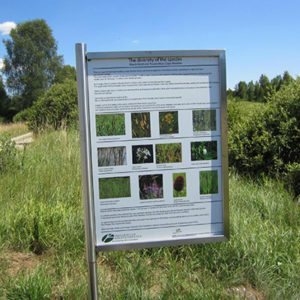 What makes this trail special are the educational displays written in both German and English, enhancing your nature experience. With each new habitat comes the potential to spot different plant and animal species. The signs display what wildlife you can find and why it calls that particular place home — as well as explain the history of the area. While the trail was established many years ago, the Bavarian State Forest Enterprise, who manages the land, installed the bilingual brochures and trail signs in the fall of 2016 to encourage Americans to enjoy nature. To get to the trail, drive road ST2166 between Freihung and Vilseck and look for a pull through. 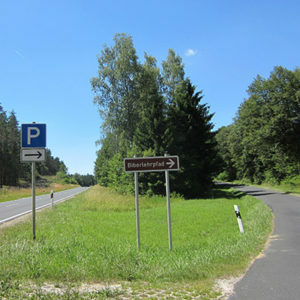 A brown sign stating “Biberlehrpfad” and a blue parking sign denote the entrance. The trail begins at the start of a gravel road, with an introductory sign welcoming you. Follow the white “Leinschlag-Beaver Path” signs to stay on the trail. 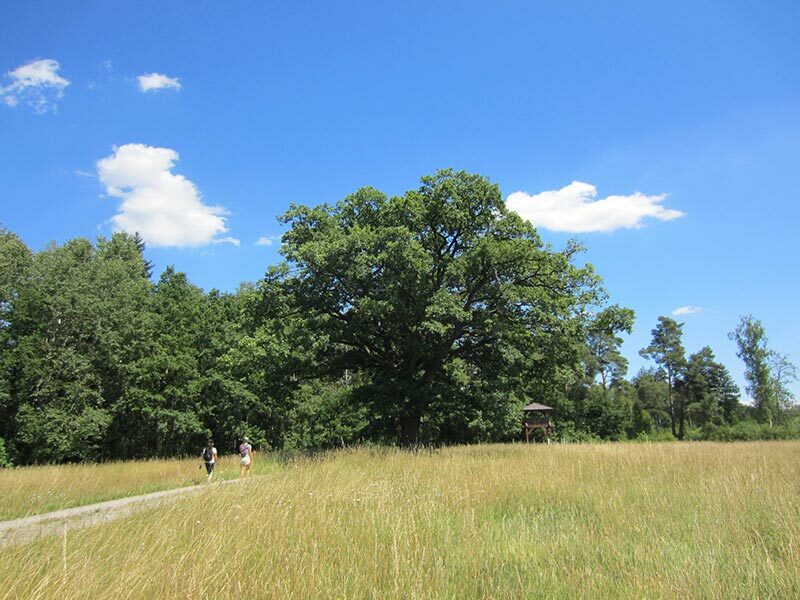 Once you reach the meadow you will find a brochure box, a sign about the history of the area and a shaded picnic table. While the trail was established many years ago, the Bavarian State Forest Enterprise, who manages the land, installed the bilingual brochures and trail signs in the fall of 2016 to encourage Americans to enjoy nature. Photos by Christine Fox. As you walk through the meadow, a bird viewing tower comes into view. The tower overlooks the surrounding ponds and wetlands, and is a great place to spot osprey, herons and ducks. Bringing along binoculars and keeping voices quiet increases your chances for discovering wildlife. Eventually the trail turns from gravel road to a narrow dirt path, which is inaccessible for strollers. The path winds its way next to wetlands providing opportunities to spot signs of beavers and for watching dragonflies dance through the air as they hunt insects. For an enjoyable nature experience, take along plenty of water, wear sturdy shoes, carry binoculars and bring along an appetite for adventure. Mosquitos and ticks are active during the warmer months, so wear bug spray and check yourself for bites. Christine Fox works for the USAG Bavaria Environmental Division and is a regular contributor. The Environmental Division provides environmental guidance, support and liaison services to those who live, work and train on our installations. Visit their webpage at www.bavaria.army.mil/environmental and find them on Facebook at www.facebook.com/USAGEnvironmental.